Spray oval 5- to 6-quart slow cooker with cooking spray. In 12-inch skillet, melt butter over medium heat. 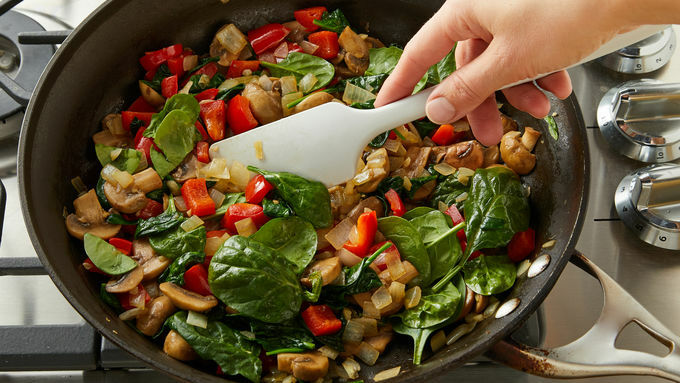 Cook mushrooms, onions, garlic and bell pepper 7 to 9 minutes, stirring occasionally, until tender. Gradually add spinach. Cook and stir just until spinach is wilted. Add green onions; transfer vegetable mixture to slow cooker. 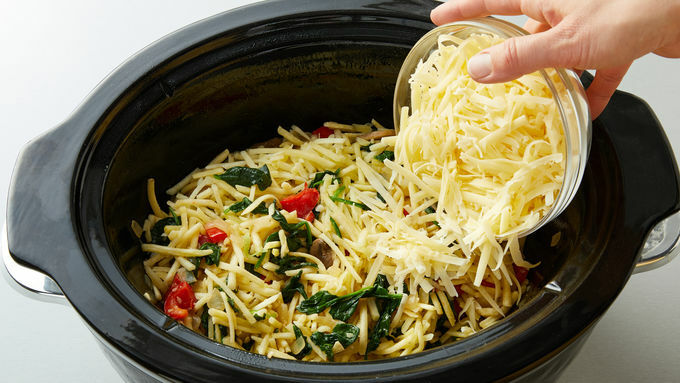 Add thawed hash brown potatoes, 2 cups of the Gruyère cheese and the Parmesan cheese to slow cooker. In blender, add eggs, half-and-half, cream cheese, cornstarch, mustard, salt, pepper, thyme and pepper flakes. Cover and blend about 30 seconds or until smooth. Add to slow cooker; stir to combine. Cover; cook on High heat setting 2 hours 30 minutes to 3 hours 30 minutes or until temperature reaches at least 160°F in center and egg mixture is set. Remove slow-cooker ceramic insert from heat. 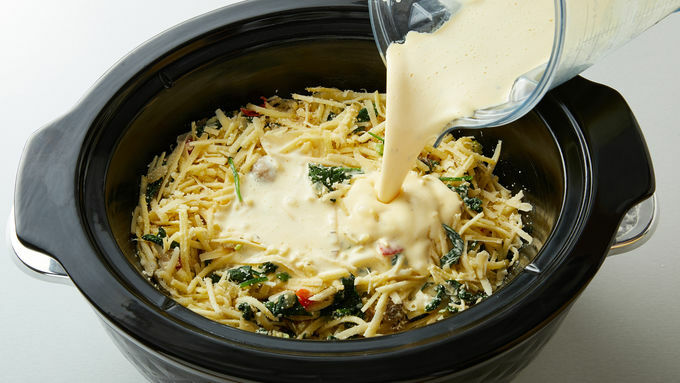 Sprinkle remaining 1/2 cup Gruyère cheese over casserole; cover, and let stand 15 minutes. 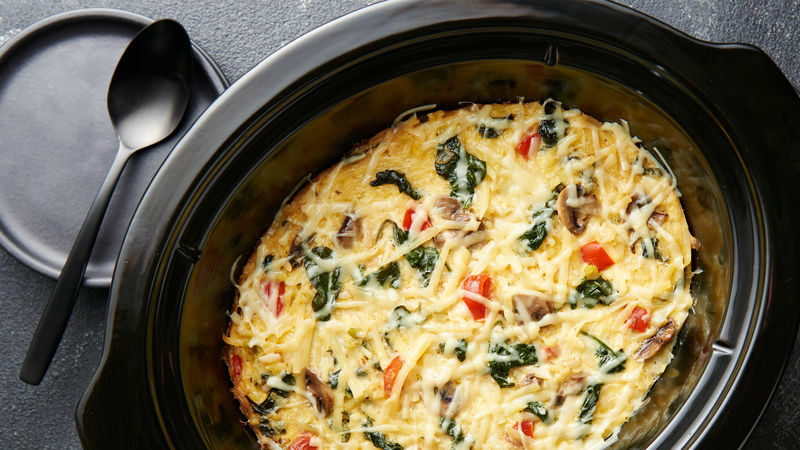 Chopped tomatoes and green onions make a colorful garnish for this egg casserole. Blending the eggs with the cream cheese and other ingredients help to give it a smooth texture. Serve this flavorful brunch strata with warm blueberry muffins and cut-up fresh fruit. Slow cookers vary. Keep an eye on your casserole so it doesn't overcook.